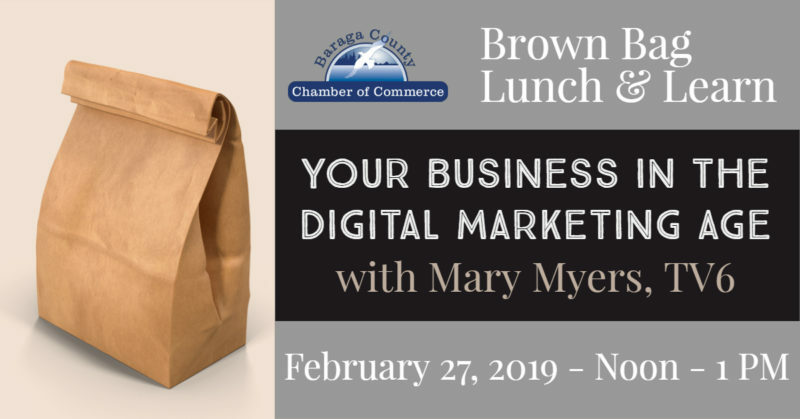 Grab your lunch and spend it at the Baraga County Chamber, 2 E. Broad Street, L’Anse, learning about Digital Marketing and what avenue would suit you best. Become informed and learn what options you have in the digital world. Let our expert Mary help you in a friendly, no-sales forum. Mary Myers has been working in advertising sales for 27 years, getting her start in print, transitioning into television, and then finally digital. Mary is supported by a Gray Digital and LocalX, TV6’s digital media company, and the UP’s best team of digital marketing professionals. Free for Chamber Members, $10 for non-members. Must RSVP by 2/25/19, seating is limited.